Intro: Nvest is a technology platform providing data and analytics for crypto traders and investors. We provide different tools or applications (apps) and enable our users to make data driven decisions. Nvest also streamlines application development and enables creators to easily build and deploy their own ideas. This means that the initial apps launched are just a sample of what will be offered in the future as the developer community grows. To kick start the platform, the team at nvest will create several applications targeted to crypto traders and investors. We will seek feedback from our users and pivot when necessary. The site nvest.io has a working version of Pattern Finder and Strategy Builder (a pre-curser to the Bot Builder tool) for users to test and explore. Current examples are first version releases used to demonstrate how traders and investors can use data and analytics in their decision making process. Version updates should dramatically improve the user experience and output results. A core thread running through all nvest applications is that they are easy to use and interpret. As nvest obtains more user data, applications will become smarter and be able to learn user preferences and provide better recommendations to a user’s specific needs. 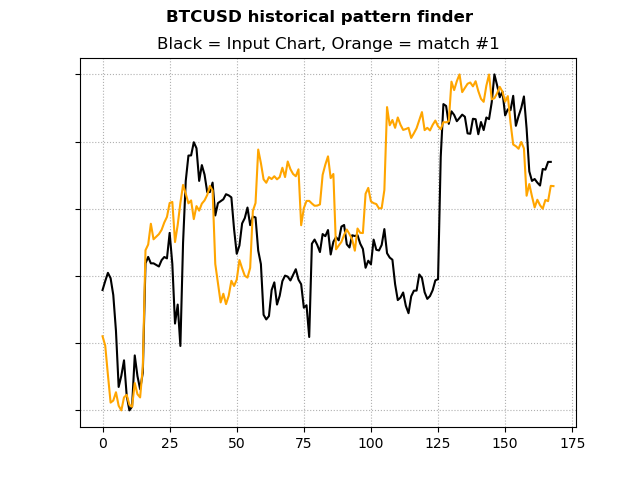 Pattern Finder is specifically built to analyze time series data, like crypto prices, volume, order flow, sentiment scores and more, in order to find patterns in the data automatically. Just as the popular music app Shazam can analyze a song in seconds, Pattern Finder can do a similar analysis on charts and data. It can scan for commonly used technical analysis, like price patterns, candlestick formations, trend lines, moving averages, ossiclators, breakouts, consolidations and many more. It works on Bitcoin, ETH, LTC or any altcoin you can think of, as long as there is price data. Try Pattern Finder on nvest.io right now! Pattern Finder’s results include many different data points, like future price probability estimates, win/loss ratios, profit targets, maximum loss estimates, best fit indicators to name a few. Armed with Pattern Finder data, traders can better analyze a trade setup, game plan for possible outcomes, or even use Pattern Finder to generate a template for an automated trading bot, with no coding required. Many traders like to look for price patterns in charts, the problem is that technical analysis can often feel more like voodoo than a science. 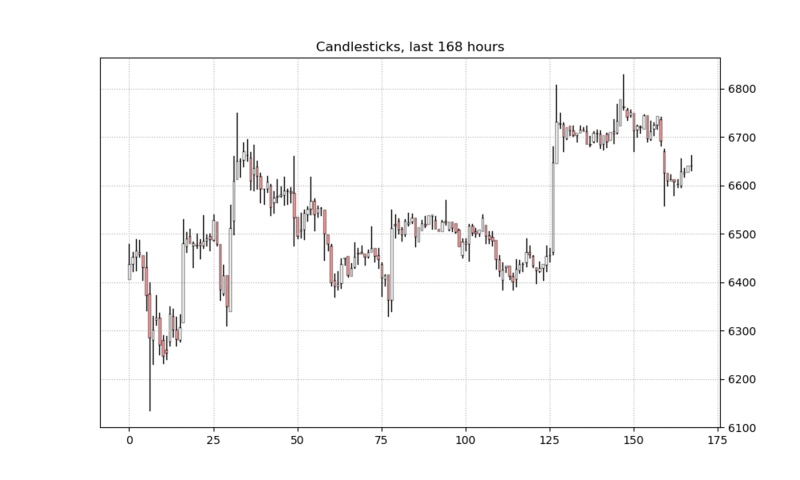 In the chart below we have a candlestick chart of hourly bitcoin prices from the end of May, 2018. In order to simplify the chart we are going to discard the High, Low and Open values from the candle stick and show just the closing prices as a line chart. Later we can add back these elements as additional ‘dimensions’ or features for Pattern Finder to search. Next we ask Pattern Finder to look through historical data and locate a similar looking price charts. The algorithim returns the following result, with our initial chart in black and the Patter Finder match in yellow. 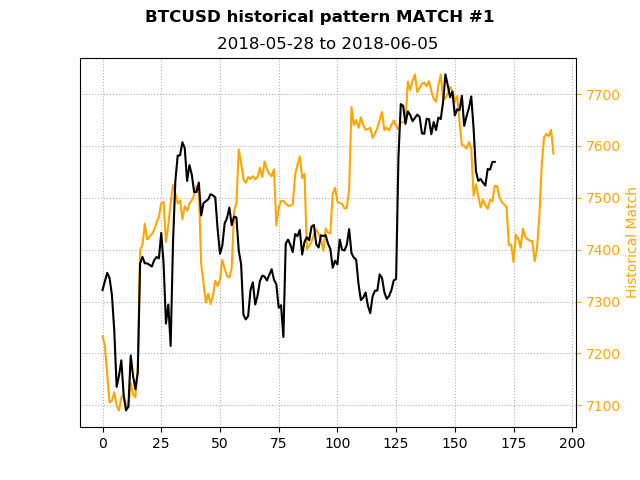 Now that Pattern Finder has identified a match with historical data, we can use that information to help provide objective statistics and data to analyze the current market. For example, we can see what happened to our ‘match’ on the following day or next 24 periods. In this case price went down a little then back up. Sticking with the just the current data, we can use it to make an estimation of what the current chart would look like if the historical path was followed. While this is a very naive and simple projection, it does provide objective insights that a trader or investor can use in their investment process. For example, advanced users can select multiple ‘matches’ and generate a wide range of statistics. While finding matches in data is pretty neat, the magic of Pattern Finder is that since its done by a computer, it can process thousands of data points across multiple dimensions and data types. 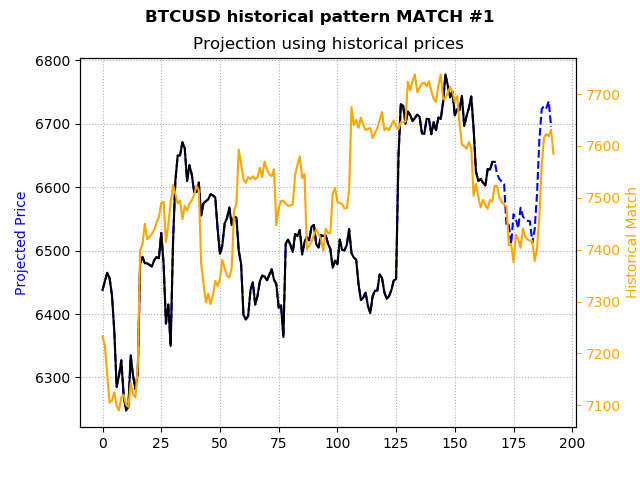 It can search for price patterns like we did above as one input dimension and combine it with candlestick formations, sentiment data, trend signals and pretty much anything you can think of that has quantified by data. Using nvest’s advanced signal processing techniques, Pattern Finder empowers users with historical data without having to write complicated back testing and trading algorithms. Instead one can think of Pattern Finder using heuristics or what is sometimes called fuzzy logic to determine the rules automatically. Nvest is collecting lots of data but it doesn’t do you any good unless you can do something with it. With Bot Builder you can easily access the data and create your own bot to perform an action with it. Your bot can be as simple or as complex as you want it; trigger an email alert if the price of Bitcoin goes above a certain level or go advanced and build your own altcoin trading strategy. Bot Builder provides easy to use templates to enable new users to experiment. Using nvest’s drag and drop user interface, built on top MIT’s wonderfully popular Scratch library, Bot Builder allows you to create your own algorithms without writing any code. Bot builder is currently running on nvest.io under the tab 'Strategy Builder'. While current functionality is limited to building a trading strategy, nvest will add useful features like email/ sms/ telegram alerts and reporting features. As crypto markets have evolved into an entire ecosystem with thousands of projects and hundreds of exchanges, analyzing the entire system can provide insights that can be missed if you aren’t looking holistically. Since nvest is in the business of collecting and analyzing data, we make it easy to analyze the entire crypto market. We leverage established solutions from traditional financial markets and apply them to crypto markets, all the while understanding the nuances and tailoring the output for crypto. Crypto Sight provides a variety of templates for users to start, including daily market summaries, crypto scans and statistical insights and guides users to build and customize to their own needs. See a sample of a CryptoSight report here. Technical traders can use pre-built scans to find trading opportunities or create their own customized versions. For more fundamental oriented investors, CryptoSight can provide a quick way to recap and filter news on specific projects and interests. Check out the gallery of crypto sight images on our reddit or twitter pages. All of these and more will be available to users, in real-time and easily customized to your own needs. Statistical analysis is good when you have numbers, but what do you do when the data you are dealing with is words and text? Fortunately machine learning has been working on the problem for a while and recent advances in the field of NLP (“Natural Language Processing”) allows for excellent analytical insights on text data. NLP encompasses a variety of different applications, from sentiment analysis, speech recognition, automatic summary, topic segmentation, relationship extraction and others (see Wikipedia). A common thread in many NLP tasks is that they require lots of data and they still involve human oversight, particularly related to training data, before the algorithmic models can be created. The good thing is that once an NLP model is loaded with the proper data and settings, you don’t need to be a machine learning expert to be able to use it. Nvest’s team of machine learning experts will provide the necessary data and supervision for NLP model creation so that users can easily build on top of our models and deploy their own NLP tools. In the example below we show the comments from a reddit daily discussion thread. 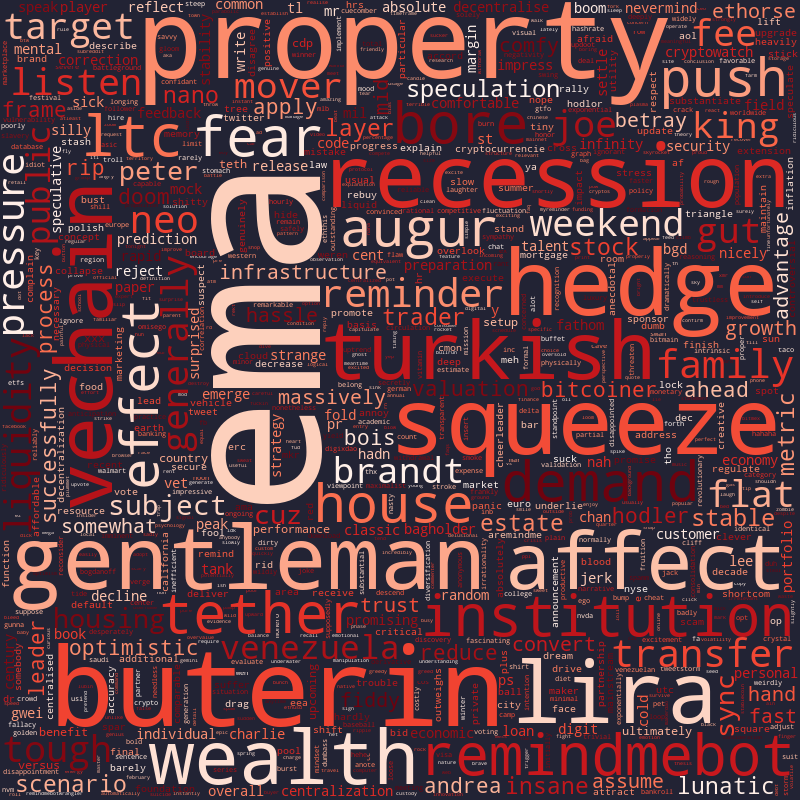 Now the same raw data but using a different NLP algorithim to process the words. Most NLP tools also allow for a high degree of customization which is often inaccessible unless you are a developer. Nvest believes that each user has their own unique needs and style and we want to provide everyone a unique experience. Creating a sentiment analysis indicator is good but creating one personalized just for you is so much better. 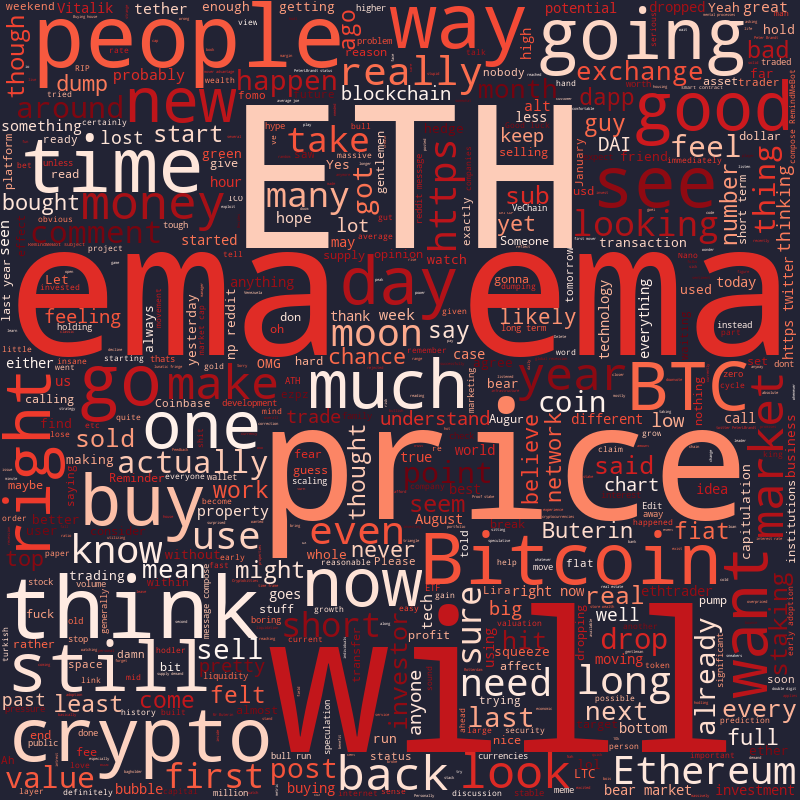 Should a day trader and a long term investor use the same sentiment analysis settings? By guiding users through the different setting available and making them easy to adjust, nvest enables each user to maximize their experience. Token Discovery tools can be applied to a variety of data sources and can be easily accessed via the nvest API. You can use Token Discovery to analyze a white paper and use the results as an input in your ICO spreadsheet. For example, if there is a particular word or phrase that you are interested with, or conversely, want to avoid, you can easily create your own Token Discovery score to scan through hundreds of white papers, bitcoin talk announcements and other data sources and receive a nightly report of the results. You can use pre-built models like a grammar score, word complexity score or even a fraud test as a new data point to include in your ICO analysis. Or maybe you want to read a review in a different language or you don't understand all the technical jargon and crypto slang, you can use NLP combined with Deep Learning to make translations for you. Enhance your ICO spreadsheet with advanced data that is processed in seconds and always up to date with Token Discovery. Detailed analysis performed by a specialist can often yield valuable information and insights that a non-specialist would never see. Nvest provides a platform for crypto experts to present their analysis and in return earn nvest token rewards. While many investors and traders publish their views and analysis it’s hard to distinguish who the experts are and what their opinions are worth. With Opinionator, nvest creates a market for both consumers and publishers of research. It allows anyone to publish their analysis with a variety of settings (public/private) and simplifies payments. Using nvest tokens as rewards, Opinionatior is ideal for new research analysts and provides them reach to the entire nvest community of users. If a given research analyst is able to provide a different angle of insight to what is generally available (ie most of the research on topic is related to technical analysis and then a cryptographer offers a totally different view) then their input should be highly valued and incentivized. Given that higher quality research should demand higher prices, consumers can also view how many nvest tokens a user has earned as an extra input when searching for research, similar to searching for high gross blog posts on Steemit. Successful investing often involves managing a portfolio of investments and for traders managing multiple positions at the same time. Porfoliorizer gives you the tools, specifically tailored to crypto markets so that you can analyze your entire portfolio. You can view attribution reports to show you where you made and lost money, monitor where your portfolio volatility of coming from, see how correlated your holdings are, create stress tests, goal settings and more. Leveraging traditional financial portfolio theories and tools, nvest’s Porfoliorizer tools will also be tailored to crypto markets, which has price volatility and skew unlike traditional assets of stocks and bonds and is more akin venture capital investments. This means that existing portfolio management tools built for the stock market may need to be modified in certain instances. Nvest expert team will ensure any portfolio tools released will be theoretically and practically adapted to crypto since most portfolio management theories and applications require a strong mathematic knowledge alongside practical understanding of how markets work. Crypto portfolio analytics are often neglected or difficult to use but with nvest we make it easy and intuitive, allowing you to analyze your entire portfolio and provide you a richer set of insights that you could get from just analyzing an individual crypto on its own. As crypto markets mature, many crypto investors will realize that managing their portfolio will be just as important as managing the next trade.